Despite having zero talent for dance, I've always been fascinated by ballet. As a tween, one of my favorite books to peruse at the library was a book geared towards the parent of ballerinas, which basically detailed the typical life of a dancer aspiring to high level. I'm drawn to any book which portrays the life of a ballerina, particularly at a professional level. In reality, ballet is merely a set-piece for the drama and characters at the heart of Tiny Pretty Things, but that's the case with all ballet-centered novels. For those who do like dance, though, there are lots of descriptions of different dance moves, specific ballets, and the detailed daily aspects of dancer life. I eat that stuff up. The people at this dance school basically live, eat, and breathe ballet (since they don't eat real food). If you're not a fan of unlikeable characters, this is not the book for you. June and Bette are different varieties of cruelty with little redemption.Kind-hearted Gigi is the extremely talented new dancer who suffers at their hands because of jealousy. I don't mind unlikeable characters if I can understand why they are they way they are. And I could relate to June and Bette, even if I strongly disliked them. They are layered characters who are under extreme pressure and have extreme drive to succeed. This doesn't excuse their behavior but the story sets up their backstories and personalities so well that their actions felt realistic. Gigi, in contrast, is a very likeable character. As naive as she is talented, she has a difficult time dealing with the mean girls. While her flaws weren't as obvious as those of June and Bette, the book does a good job of showing how a nice person reacts to cruelty. Each of the characters has some romance in the story. Romances ending, romances beginning, back-stabbing romance - the whole gamut. I wasn't as happy with the romance. I couldn't take it seriously because so much of it related back to various awful things June or Bette or other characters had done. The boys were often tangentially involved, which made it difficult to trust that any of these romances were real. I couldn't lose myself in the story because I was waiting to see what people would do next. My other main qualm with this book is that certain plot elements were not fully developed. Or if they were fully developed, it was done in such an odd way that it flew right by me. Worst of all, the book just ended. I'm all for open endings, but this felt far too abrupt. There was a semblance of a conclusion but an insufficient resolution of the characters' arcs. Is there a sequel in mind? Not that I know of. This book is great for people who are trying to diversify their reading. The authors are of color, which is unfortunately rare in the book world. Gigi is Black and June is half-Korean. There are also multiple LGBT characters in varying states of outness and extreme in-ness. Race and sexual orientation is not a main issue of the book, but as in real life, it's always there lingering in the background - and that is acknowledged in the plot in realistic ways. 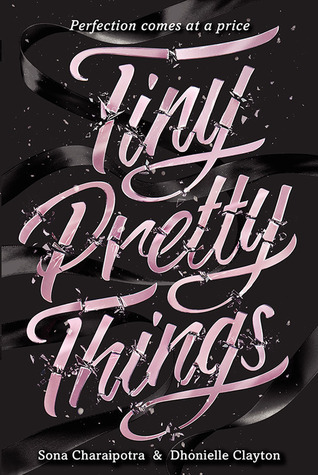 Tiny Pretty Things is not a perfect book. But it is a good book. It's not a book that one particularly enjoys, because it's all meanness. But it is a book that fascinates. I think it's a book worth seeking out. I heard the author spoke and she intrigued me enough to pick it up. Otherwise I wouldn't really think twice about it. Glad you enjoyed it overall despite some of your issues.